A petition circulated by local bartenders that seeks to amend a state liquor regulation has gained more than 400 signatures in 24 hours. The petition is an effort to change a Vermont Department of Liquor Control regulation that prohibits adulterating or tampering with alcohol after its manufacture. In practical terms, this means a bartender cannot infuse spirits with ingredients, flavors, herbs or spices — a common practice that is part of mixing a craft cocktail. Leunig's Bistro & Cafe who signed the petition. "A bartender is similar to a chef in what they do. And anything that restricts what we can do with those products, restricts what you get to drink at the end of the day." The change called for by the petition would "update a regulation to the practice, to what's going on," Dunoskovic said. "We're not doing anything in the shadows. We're not doing anything new. These are common practices: Customers love it; bartenders love it." The Vermont chapter of the United States Bartenders' Guild wrote and circulated the petition after the state DLC embarked in recent weeks on an enforcement-and-education campaign related to Regulation 43. That's the regulation that prohibits house-infused spirits at bars and restaurants. 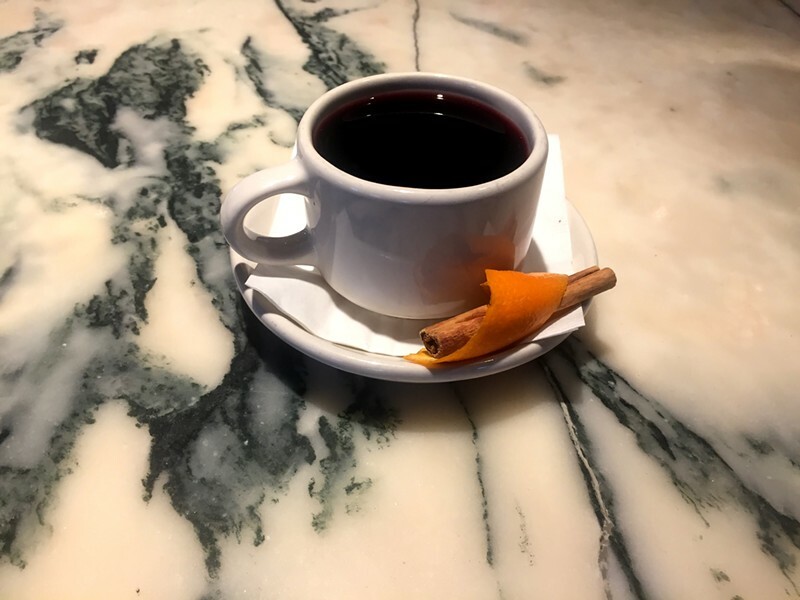 The DLC's enforcement effort came after it received a complaint from a patron who believed she became ill after drinking "craft-infused liquor" at a Burlington restaurant, said Skyler Genest, director of the DLC compliance and enforcement division. The customer "wanted to know if it was OK for a bar to do that," he said. The answer, according to federal law and Vermont regulation, is no, said Genest. "It's very clear under Regulation 43 that [a bartender] can do nothing to adulterate, dilute or fortify any bottle of alcoholic beverage," he said. The Vermont regulation corresponds with a federal law that prohibits adding substances to or altering a bottle of alcohol without a rectifier's license, he said. "Our goal here is to encourage compliance," Genest said. "A big part of the enforcement detail was paired with an education campaign." 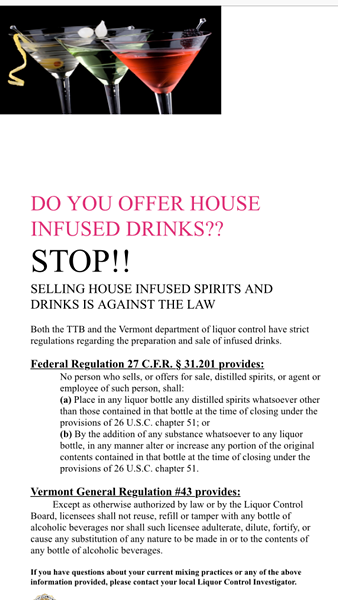 Toward that end, DLC investigators distributed fliers to Burlington bars and restaurants on January 11, warning that "selling house infused spirits and drinks is against the law." The online petition that launched Tuesday afternoon had 481 signatures at 5:50 p.m. Wednesday. It seeks to amend the state regulation to allow bars to infuse spirits if the products are clearly labeled and identifiable, according to Sam Nelis, president of the Vermont chapter of the U.S. Bartenders' Guild. The bartenders' goal is "to keep the laws in Vermont and the industry in Vermont progressive and competitive nationwide," Nelis said. "Vermont is known for craft. It goes hand-in-hand: local, craft, fresh. I want to keep the cocktail-bar side of things relevant." The current regulation, Nelis said, is constraining professional bartenders "who pride themselves on being artists and being creative. These are cocktail chefs, and outdated laws can hold us back." Leunig's, for example, is no longer making its longtime popular cocktail Glug in the manner it had for years in order to comply with the regulation, chef and co-owner Donnell Collins said. The process involved steeping wine with spices for 24 hours. "I feel for these wonderful bartenders," Collins wrote in an email. "I know being creative with my food menus is one of my favorite things about my job ... It is the same for them." El Gato Cantina on Church Street, according to the DLC. The investigation did not determine that a customer became sick drinking a cocktail at the restaurant, but it did find that the business violated a regulation by serving house-infused tequila, according to Genest. "My department and my division take very seriously our mission of ensuring public safety," said Genest, who is aware of the petition. The federal and state regulations are in place to prevent "potential negative health outcomes." Tree Sanchez-Bertram, owner of El Gato in Burlington and Essex, paid a $510 fine last December for the violation. She signed the petition on Wednesday. People loved El Gato's jalapeño-infused tequila, Sanchez-Bertram said. "It's our craft, it's our art," she said. "This is disheartening. We're restaurant owners trying to bring this amazing food and drink to our city." Since 2014, the DLC has issued eight warnings related to Regulation 43 and three violations.